Movie experience is of course not complete if you don't have the merchandise. There are a lot of Thor merchandise now released on stores for ranging from prop replicas to action figures. These collectibles are must buys for collctors but most of them specially good items are extremely expensive. But don't worry, if you want to own that Mjolnir hammer from the movie I know where exactly you can get it for free. I heard the toys are already running out of stocks. So go ang rush to your nearest Jollibee outlet now before you regret not having this fabulous toys. Kids who have watched the movie Thor gave positive feedback. 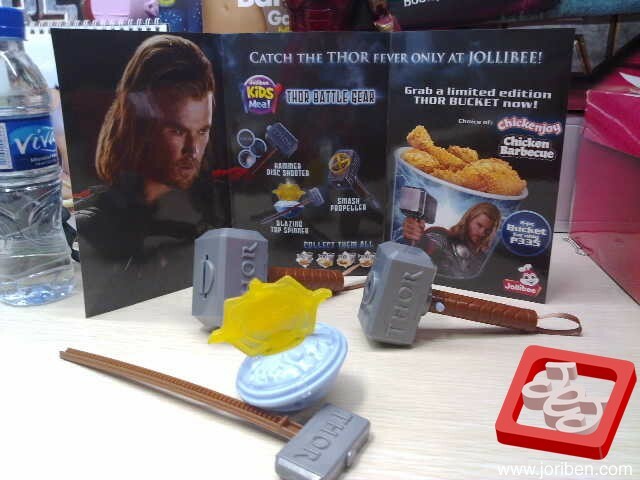 Jollibee made the right decision of producing this Thor collectibles in their kiddie meals.